Specialties — V. Cirace & Son, Inc.
With its unmistakable mushroom shape, apparently inspired by the dome of St. Sofia’s Church in Constantinople, the baba is a leavened oven-baked sweet soaked in Lemoncello. Despite the fact that everyone associates it with the South of Italy, baba – whose name allegedly derives from that of Ali Babà – originally came from Central Europe, then brought to Naples by the “monsù”, as the chefs serving the aristocratic Neapolitan families were called. This brings us up to the memorable date of 1836, when the baba appeared as a typical Neapolitan sweet in the first Italian cookbook written by Angeletti. Basically, an authentic Neapolitan baba needs to comply with one rule only: it has to be delicious on its own. A dough leavened to cloud-like consistency, one night for it to dry out thoroughly and one long soak in a flavored syrup. Nothing else: no chocolate, fruit, whipped cream or jam brushed onto the surface to make it glossier. Produced in the tradition of four generation family Maurizio Russo Company, located in Cava de Terrini at the base of the Amalfi Coast. These artisan honeys are produced by Apicella Agricola in town of Cava de Terreni located at the base of the Amalfi Coast. He sets his hives in gardens and groves so the bee's find the nectar of the fruit or flowers. Amalfi Coast Lemon, Blood Orange and Mirafiore ( Wild Flower) are the three available types. 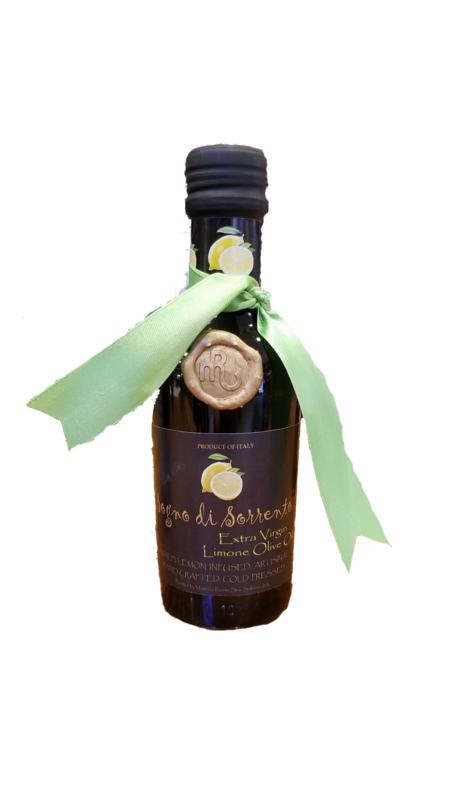 Sogno di Sorrento extra virgin olive oils are produced exclusively for us by Agricola Apicella located in the town of Lapio, Avellino. This small, artisan producer picks his olives by hand at their ripest point. The infused lemon and blood orange oils are infused with selected IGP lemons and blood oranges from Amalfi. Perfect with salads or drizzling over grilled fish, salads and antipasto. Lemon Infused $19.99 250 ml. Blood Orange Infused $19.99 250 ml. Extra Virgin Olive Oil $ 19.99 250 ml. Lisa’s passion for fine glassware and antiques stemmed from her mother Francesca, who opened an antique shop with her dear friend Liz Donahue over 40 years ago on Charles Street in Boston. She has collected antique glasses and decanters through her travels to enhance your indivisual gift selection. Our hand-made ceramic collection originates from selected artists in Vietri Sul Mare along the Amalfi Coast. The production of ceramic works is realized by craftsmen using techniques handed down over the centuries. The decoration is done by hand using figures and patterns that reflect the Mediterranean culture and way of life. The success of this craftmanship makes each article produced a unique work of art. We are featuring to craftsmen from Ceramiche Artistiche Vietrese Orchidea and Ceramiche la Vietrese D'Arienzo. Please visit the shop for our selection of Italian ceramics as well as beautiful antique decanters and glassware. V. Cirace & Son, Inc.